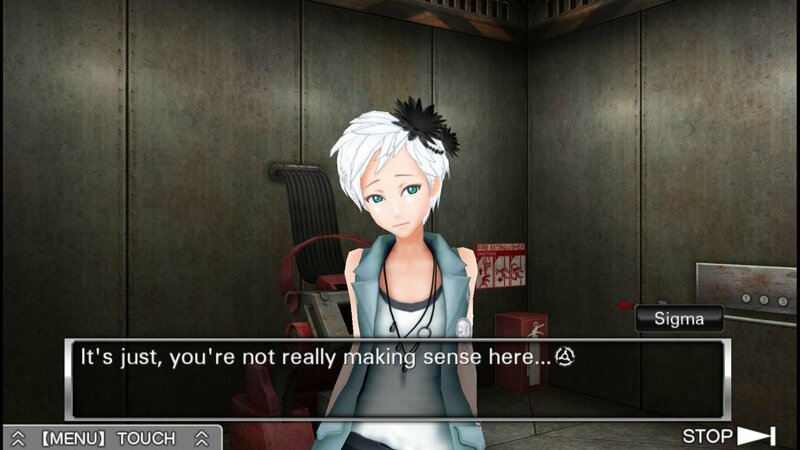 The Zero Escape franchise has never had an easy time of things. 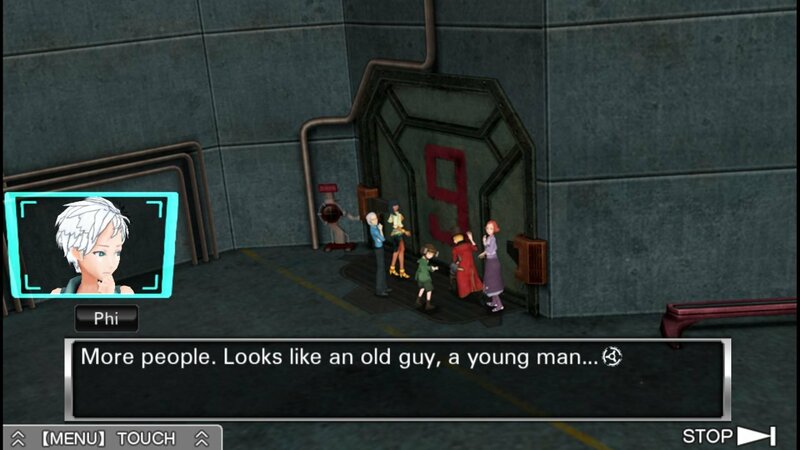 999: 9 Hours, 9 Persons, 9 Doors fell into the unfortunately massive pantheon of quirky, excellent DS titles that didn’t sell particularly well, like Ghost Trick or Lux-Pain. Its follow-up, Virtue’s Last Reward, sold exponentially worse, at about a tenth of the original’s numbers. That’s always been very unfortunate to me, because Spike-Chunsoft’s weird, twisted visual novels were a clear predecessor to the wildly successful Danganronpa, and I’d argue the superior products thanks to less edginess and more cerebral writing. Thank God, then, that Aksys saw fit to repackage both titles and make them easier than ever to play. Zero Escape: The Nonary Games is a bundle of both 999 and Virtue’s Last Reward, finally allowing players to experience both games’ interwoven narratives back-to-back without worrying about switching between platforms. Having cleared 999 again and played a good portion of Virtue’s Last Reward (which is roughly two to three times longer than the original,) it’s clear that these aren’t quick and dirty port jobs, either. Aksys is putting its best foot forward to snag new players, it seems, and that’s impressive as a fan. 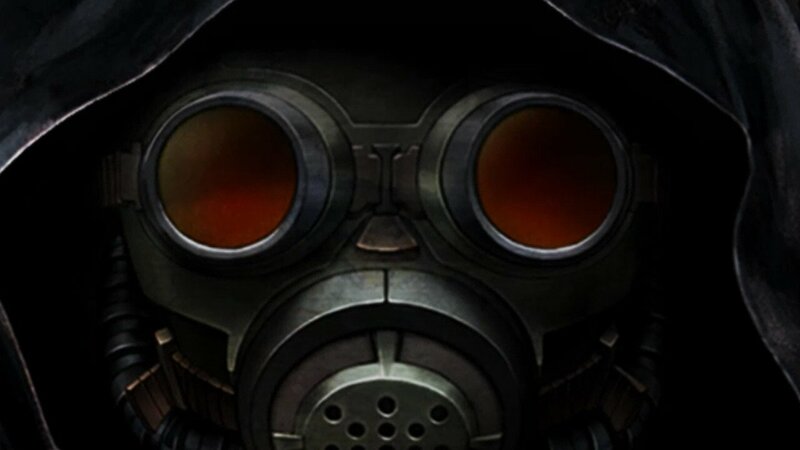 For the unfamiliar, the Zero Escape games could be thought of as ”anime Saw.” Both titles involve a cast of characters being kidnapped and forced to participate in The Nonary Games – twisted sets of puzzles in which the victims have a limited amount of time to escape before they’re killed. If you’ve seen a Saw movie, it’s pretty clear where this is heading. All participants end up being pitted against each other, whether by design or because of their own ulterior motives, and everyone involved is there for a reason that players might not initially suspect. The comparisons to Lionsgate’s hit horror franchise, however, go out the window when players get into the nitty-gritty of each game’s narrative. Things go off the rails in both games in terms of narrative decisions, arguably quicker and more obviously in Virtue’s Last Reward. What begins as a fairly believable exploration of the prisoner’s dilemma gives way to hilariously elaborate nonsense, like telepathy, time travel, and multiverse theory. Entire plot threads crucial to understanding the overarching lore are built on ridiculous pseudoscience and require the patience of a saint as far as suspension of disbelief is concerned. That said, both titles do an excellent job of not making players realize how stupid it all is until they’ve put down either game. Much like the works of Shu Takumi, particularly Professor Layton vs. Phoenix Wright, even the most absurd plot twists are genuinely engrossing and feel super important when one is actually playing the games. This speaks volumes to how engrossing each member of the core cast is, and how masterful both games are at building suspense through atmosphere and well-timed plot twists. It’s all very silly, but in the moment, every twist and turn feels brilliant. Aside from scrolling through text, which is roughly 90 per cent of both titles, players will be asked to solve puzzles to progress. They’re never particularly challenging, specifically 999’s mostly simplistic and easy-to-grasp puzzles, but Virtue’s Last Reward definitely feels like the more complex of the two games in terms of mechanics and depth. Both titles do a great job of thoroughly explaining the mechanics and establishing sets of rules for how to solve any given situation, too, and don’t ever threaten to leave players entirely lost. Scrolling through text and solving puzzles has rarely looked as good as it does in these games, as well. Despite the PC version not supporting 4K resolutions, which left me feeling a little miffed, the visuals in both titles look excellent considering their origins as portable titles. I’m particularly fond of 999’s expressive 2D character portraits and animations, which make up for the occasionally janky and archived 3D cutscenes. Virtue’s Last Reward’s 3D doesn’t look too shabby either, and the expression and animation of each character is aided by the bump in resolution and framerate. Both titles also have fantastic scores throughout, with the music always managing to build tension at any given moment. In addition, 999 has been given a full vocal track for the first time, which is mostly good. A notable low point, however, is protagonist Junpei’s English voice actor, who sounds lethargic and wooden throughout a significant portion of his lines. While I do think the best way to play both of these titles is on the 3DS (some puzzles just work better with the dual screen setup,) there’s no denying the quality and value of Zero Escape: The Nonary Games. It’s never been easier to play these games, and if you’ve never had the means to, they’re truly worth it. Both titles are superior predecessors to the Danganronpa titles, and treat their subject matter with a maturity that series never quite reached – even when the narrative treads into bonkers territory. For the price point, these are fantastic titles that any fan of decent puzzles and excellent writing should pick up. It’s never been easier to play the Zero Escape titles than it is now, and for the money, any fan of heady narratives and fun puzzles is in for several hours of quality entertainment.